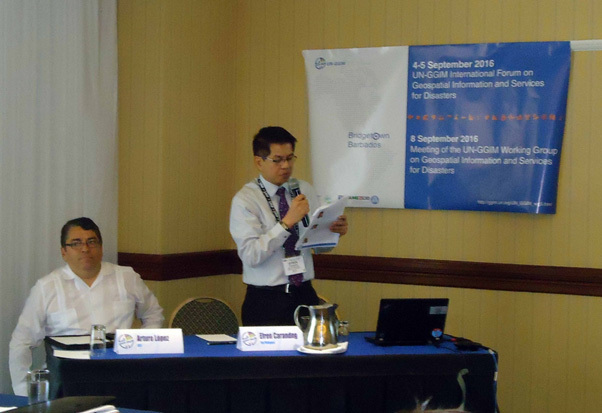 Dr. Peter N. Tiangco, NAMRIA Administrator, led with Mr. Rohan Richards of Jamaica, the UN-Global Geospatial Information Management (GGIM) International Forum on Geospatial Information and Services for Disasters in Bridgetown, Barbados on September 04-08, 2016. The forum is one of the global consultations of the Working Group on Geospatial Information and Services for Disasters. The series of consultation activities aims at gathering support for the “Strategic Framework on Geospatial Information and Services for Disasters 2016-2030” leading to its endorsement by the UN Economic and Social Council (ECOSOC) to the UN-GGIM Bureau. The forum was attended by the Caribbean and South American nations including United Kingdom, Unites States and Canada, as well as some international organizations. 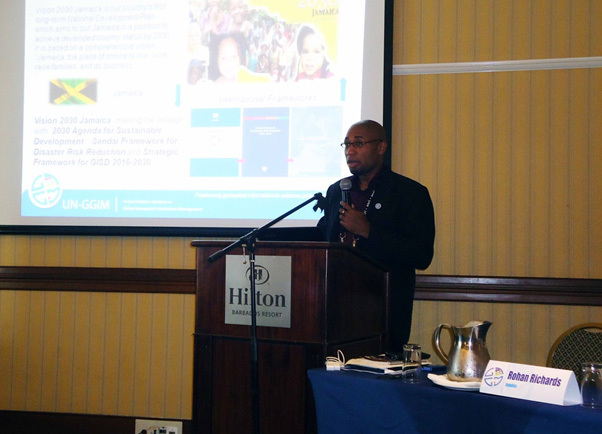 The event coincided with the eighth annual GIS conference of Urban and Regional Information Systems Association (URISA) in the Caribbean region. 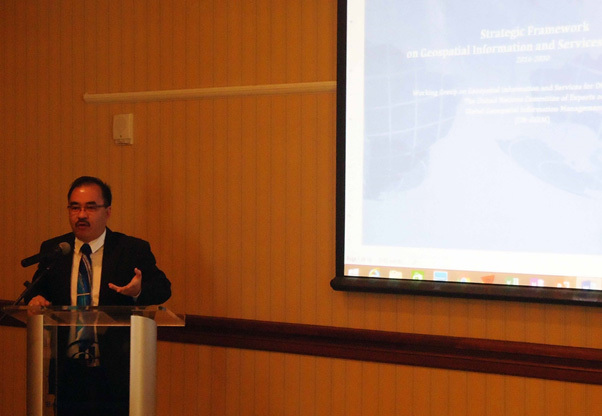 As co-chair of the working group, Dr. Tiangco delivered his welcome remarks during the opening ceremony, along with key international personalities from the geospatial information management community. 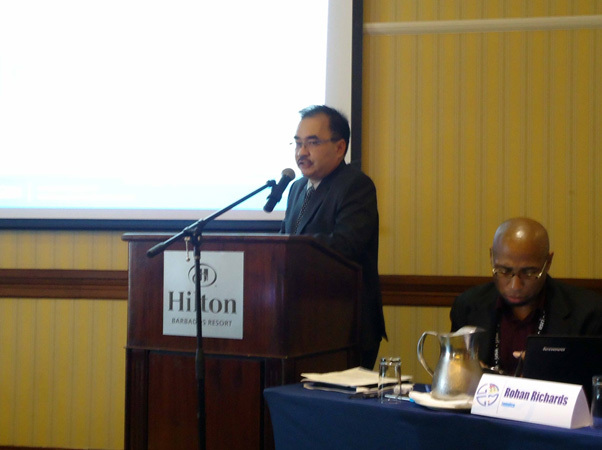 H. E. Mr. Denis Kelman, M. P. Minister of Housing, Lands and Rural Development of Barbados gave the opening remarks. Co-chair Mr. Richards, Principal Director, Ministry of Water, Land, Environment and Climate Change of Jamaica presented the “Fact Finding Study and Review of Framework, Rules, Legislation and Policies on Geospatial Information and Services for Disasters.” Dr. Tiangco likewise presented the latest version of the framework before the forum participants. This version was updated based on the inputs from the 6thUN-GGIM conference and side event meeting in the UN Headquarters in New York in August 2016. In the same forum, Dr. Tiangco presented the potential areas of collaboration between the framework and the other UN approved frameworks namely, Sendai Framework and 2030 Agenda for Sustainable Development. 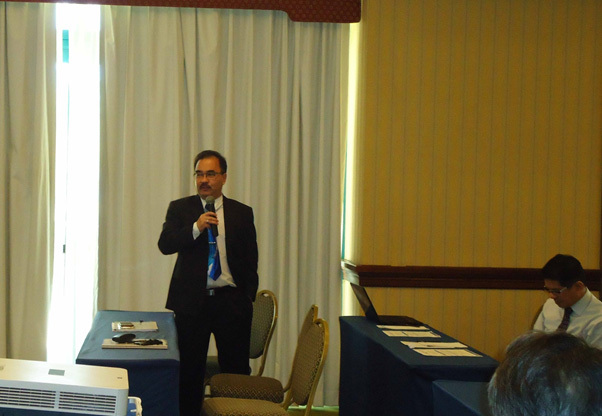 He also moderated the session on “The Future We Want” for geospatial information and services for disasters. The forum discussed the experiences, practices, approaches and challenges before, during and after disasters by Member States and experts around the globe. NAMRIA’s Deputy Administrator Efren Carandang moderated the “during disasters” session. During the forum, comments and suggestions were raised which, in turn, were incorporated into the framework. The two-day exchange of ideas and information resulted in new inputs which led to an enhanced version of the framework which was again presented in the plenary on the forum’s final session. In the final day, a draft ECOSOC resolution was presented by Mr. Richards for UN-GGIM Bureau’s consideration in the future. The succeeding activities of the working group such as preparations for the future global consultation activities, UN endorsements and national implementation plans, were discussed. These will now constitute the revised work plan of the working group for the 2016-2018. The working group was established during the Fifth Session of the UN-GGIM in August 2015. Its purpose is to develop and implement a strategic framework on geospatial information and services for disasters. The goal of the strategic framework was defined as the timely availability and accessibility of quality geospatial information in support of coordinated decision-making and operations across all sectors and phases of the emergency cycle. To ensure its effective implementation across various levels of decision-making, the following five priorities for action were identified: (1) Governance and Policies, (2) Awareness Raising and Capacity Building, (3) Data Management, (4) Common Infrastructure and Services, and (5) Resource Mobilization. The members of the working group from the Philippines are NAMRIA’s Deputy Administrator Efren Carandang, Director John Fabic and Information System Analyst Annrou Ramos. Dr. Tiangco delivers his opening remarks. To his right is Co-Chair Rohan Richards of Jamaica. Dr. Tiangco presents the Strategic Framework. Dr.Tiangco fields questions from participants. DA Carandang moderates a session during the forum. Beside him is Carlos Valdes of Mexico.